It is so important to be one's own type of beautiful despite what others may think. Plastered on an old brick wall in a random location in Los Angeles, is one of the most moving pieces of graffiti. Its name is "Nobody Likes Me". The simplicity of Banksy's art adds to its mystique. A little boy, maybe age seven or eight, in green, is pictured crying. Above him, identical to an Instagram post is an image that reveals why he is sad: he has zero likes, followers, or comments. A flurry of questions fills the minds of the curious people who observe him. Are boys this age even allowed to have an Instagram? What does this image say about the next generation of children influenced by social media? Is social media a form of validation? Every day, hundreds of people walk by this graffitied little boy. Some of them taking pictures of him, or many others walking by ignoring him. Every day sunrise and sunset passes by, as the image looks out onto the busy city people. People from all different kinds of backgrounds see him. Sometimes: old, young, black, white, gay, straight. Not many people understand. A person is a person and all he knows is that he is desperate for someone to understand him. That's what Banksy wants. The art is not for anyone in specific, but rather for anyone who can try to understand. Banksy's art isn't a form of rebellion. It isn't an attempt to ruin any pieces of property. His intentions are completely pure: he wants people to understand his messages and take something away from it. A lot of times this piece of art is invisible to people. Rarely do people walk up to the graffiti and contemplate why the little boy is upset. Some people don't even see him. A lot of older generations don't understand him. Banksy probably hopes that the minds of the people passed by being challenged. Although Banksy knows the meaning of his art, as any artist wishes, can get someone thinking. A lot of the older people that see the little boy probably associate the graffiti with trouble. Graffiti is a lot more than that though. If more people were to take notice of this art form and try to understand the meaning behind it, then maybe more people would be aware of the effect that social media has on our generation, and generations to come. Social media is an uncomfortable topic for a lot of people. With the fame of Instagram models rising, this tends to set the standard of beauty for so many young girls. For a lot of women and girls who do not look like these perfectly sculpted women, begin to hate their appearance. This is what the little graffiti boy challenges. Banksy is using this little boy to get a major societal point across. It is clear that the artist is voicing his opinions about how social media affects all of our lives. This became evident to me when I saw other observers capturing the little boy with their phone cameras instead of enjoying the art. It is very ironic that so many people take a picture of the little boy and post it right back onto Instagram, in order to gain likes and comments. When I went to see the little boy, there weren't a lot of people there. Once other people began noticing my boyfriend and I admire the art, some of them began coming by to observe as well. It is sad that more people don't notice this art, and honestly, I was extremely shocked that it wasn't busier. The image is beautiful and carries so much meaning. The piece of art begs for people to appreciate and more importantly understand it. The image's meaning is so beautifully conveyed. With social media being so important to so many people, it begins to influence our happiness. The little boy's title even speaks volumes about what the image means. It is a double entendre that explains that if no one "likes" your post on Instagram, people may not like you in real life. Sadly, so many millennials feel this way. The meaning of the little boy to me is that it is okay to not be "liked" on Instagram. It is okay to post things that are beautiful to you, and not conform to the ideas that mainstream Instagramers post. Banksy has done such a beautiful job on addressing major societal issues through his street art. The little boy says so much about the society that we all live in, and it makes a lot of people think twice about the message behind the art. Banksy is an amazing artist who is challenging social norms. The world truly needs more artists like him. The little boy shows us that we can live a happy and successful life without conforming to what social media tells us we have to be like. I believe that messages, like the little boy portrays, are so important for the younger generations. It is so important to be one's own type of beautiful despite what others may think. This is why I think that Banksy did an outstanding job of portraying this idea through the little boy. Banksy's work can be found here. An Interpretation Of Frida Kahlo's "What The Water Gave Me"
She was more than just her pain. During Frida Kahlo’s lifetime (and after), many viewers of her art have limited her capabilities and understanding of politics to the minimum by corralling her to the corners of her mind labeled “pain” and “suffering”. Janice Helland, however, brought to light these other thoughts and notions beyond pain and suffering in the form of politics and culture. In her article “Culture, Politics, and Identity in the Paintings of Frida Kahlo,” Helland states that Kahlo purposefully inserted Aztec symbolism within her paintings to represent her longing for the renewal of pre-Columbian times, a time where Mexico had their own identity and was not controlled by other nations. Also, mentioned by Helland was the constant symbolism linking towards how much Kahlo disliked the United States and preferred her life in Mexico by ten fold. Helland’s article made the reader understand that Kahlo was a woman of great capability in not only her paintings of pain, but in the portrayal of love towards her nation and the sacrifices she was willing to make to have it back. Pain and nationalism are not the only thoughts and feelings present either, but are the fuel to the fire that led to her political beliefs and turn towards communism. 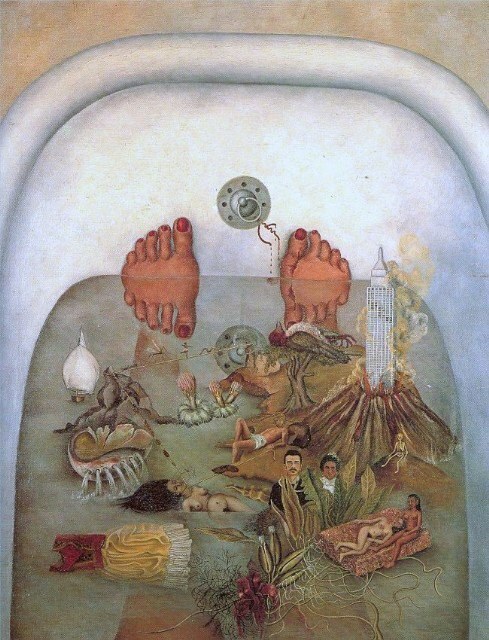 In Kahlo’s painting, What the Water Gave Me (1938), painful, personal, cultural, and political thoughts are present, yet are each interconnected in a way that one set back was the result of another and all thoughts are living together in the tub with her. During the time when Kahlo painted the painting, her relationship with her husband, Diego Rivera was strained by the constant infidelities committed by each other, which is symbolized by the diamond shaped line connecting to the dead woman’s neck in which a man is on the other end of it, pulling. These strings of affairs and Diego’s stubbornness to leave the United States resulted in the man being imaged still on the island in which the Empire State Building is on while the woman is floating in the water, unable to go any further since she is being choked, when all she wants to do is return to her Tehuana dress, her culture. This suppression then leads to dislike towards the United States, which is imaged in the painting with the Empire State building being swallowed up by a volcano. The volcano symbolizes her culture, which in turn dominates the building and expresses her preference. If the volcano and the building try to mix, gangrene starts to spew out to show that both cultures will never be able to mix in her eyes, or at least, she will not be able to live in both areas and call them both home. example of her great mind as well as the complexity of some of the symbols and the background information on it, like the Tehuana dress and the Quetzalcoatl. Kahlo would not have stood for being corralled into a corner of pain and suffering expecting pity while she was alive, so why should we start corralling her there now?